Reigning MX2 World Champion Pauls Jonass has had to withdraw from the Grand Prix of Italy at Imola this weekend, the twentieth and last round of 2018 MXGP, to undergo surgery on his right knee. The 21 year old Latvian was advised to have a reparative procedure on his right ACL in the wake of his crash at the Grand Prix of Turkey earlier this month. Jonass decided to race with painkillers at the Grand Prix of the Netherlands two weeks ago to revive his chances of defending the MX2 crown on the KTM 250 SX-F. Despite his efforts to take the MX2 title fight to the last of the twenty rounds and forty motos this year, Pauls was regrettably forced to have the operation. He travelled to the renowned Ortema facility in Stuttgart and was under the supervision of Dr Jorg Richter as the partially torn ACL was fixed without the need for a full reconstruction on Wednesday. He is expected to leave the clinic in Germany by the end of the week. 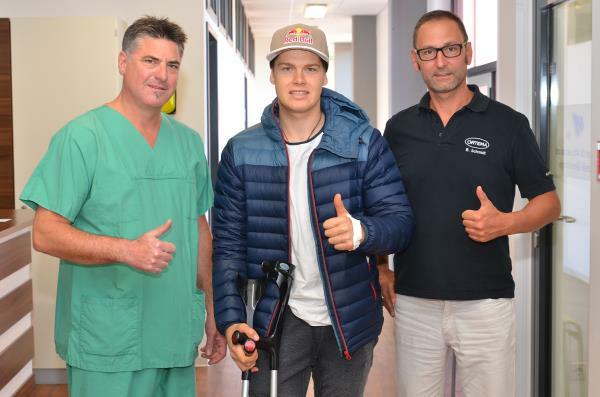 He will begin the process of rehabilitation and look towards a debut term in MXGP in 2019. Pauls’ absence from Imola this weekend means that teammate Jorge Prado is confirmed as the 2018 MX2 FIM World Champion in just his second term in the Red Bull KTM Factory team. Following on from Jonass, the Spaniard is the eighth different rider to have earned MX2 success with KTM in fifteen years.